Preface: What is Your Life’s Goal? Finding your path in life is your goal in life. Your path is not your profession, how much money you make, your title, or your successes and failures. Finding your path means finding out what you were put here on this earth to do. What is your life’s purpose? Why were you given this gift called life? And what is the gift you give back to life? Most people are programmed early in life to “Go to school and get a job.” School is about finding a job in the E or S quadrant. It is not about finding your life’s path. Trust your intuition, heart and have guts. 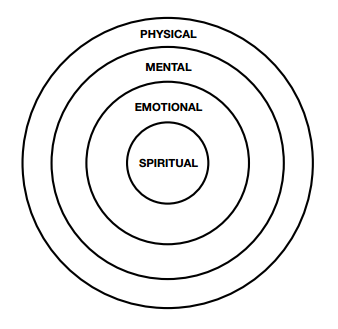 To develop into a whole human being, we need mental, physical, emotional, and spiritual education. Traditional schools were primarily about developing students mentally. That is why so many students who do well in school, do not do well in real life, especially in the world of money. School programs students to be an employee in the E or S quadrant. Traditional education is not the place for a person who wants to be an entrepreneur in the B and I quadrants. Become an entrepreneur in education. It seems that our paths in life are not found in our minds. Our path in life is to find out what is in our hearts. The shortcoming of traditional education. Millions of people leave school, only to be trapped in jobs they do not like. They know something is missing in life. Many people are also trapped financially, earning just enough to survive, wanting to earn more but not knowing what to do. 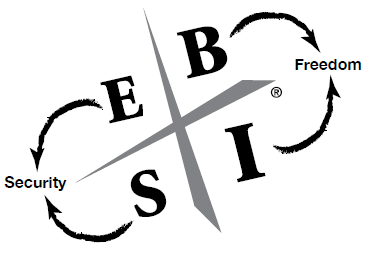 Without awareness of the other quadrants, many people go back to school and look for new professions or pay raises in the E or S quadrant, unaware of the world of the B and I quadrants. Most addictions are attempts to find happiness in people’s souls. Many “A” students get stuck in “analysis paralysis,” studying every little detail, but failing to do anything. This “analysis paralysis” is caused by our educational system punishing students for making mistakes. If you think about it, “A” students are “A” students simply because they made the fewest mistakes. The problem with that emotional psychosis is that, in the real world, people who take action are the ones who make the most mistakes and learn from them to win in the game of life. The reason so many people fail to achieve success is because they fail to fail enough times. One of the reasons so many people cling to job security is because they lack emotional education. They let fear stop them. Introduction: Which Quadrant are You in? The CASHFLOW Quadrant® is a way to categorize people based on where their money comes from. Each of us resides in at least one of the four sections (quadrants) of the CASHFLOW Quadrant. Where we are is determined by where our cash comes from. Many of us are employees who rely on paychecks, while others are self-employed. Employees and self-employed individuals reside on the left side of the CASHFLOW Quadrant. The right side is for individuals who receive their cash from businesses they own or investments they own. While financial freedom can be found in all four of the quadrants, the skills of a B or I will help you reach your financial goals more quickly. Successful E’s need to become successful I’s to ensure their financial security during retirement. I often ask myself: “Am I building a pipeline or hauling buckets?” “Am I working hard, or am I working smart?” And the answers to those questions have made me financially free. 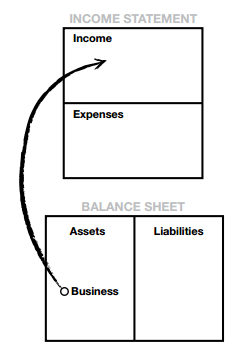 To be a B or I, you must be able to control the direction of your cash flow. We are in the Information Age which offers more opportunities for financial reward than ever before. Chapter One: Why Don’t you Get a Job? To someone who values a job, it’s difficult to explain why you might not want one. Anyone who says that money isn’t important obviously has not been without it for long. A college education is important for traditional professions, but not for how these people found great wealth. While money is all the same, the way it’s earned can be vastly different. 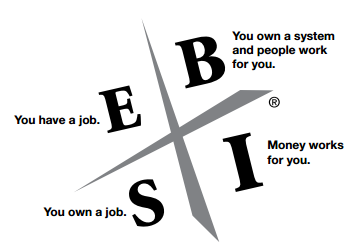 You Can Earn Income in All Four Quadrants. It’s not so much what we do, but more how we generate income. It is foolish to spend your life working for money and to pretend that money wasn’t important. Life was more important than money, but that money was important for supporting life. You only have so many hours in a day, and you can only work so hard. So why work hard for money? Learn to have money and people work hard for you, and you can be free to do the things that are important. Changing quadrants is often a change at the core of who you are. Know the core differences that cause people to seek different quadrants. Know that, and life will be much easier. Changing quadrants is most often a life-changing experience. It’s a change as profound as the age-old story of the caterpillar becoming a butterfly. To be great leaders, rich dad stressed that we first had to be great listeners. If you don’t listen to the words a person uses, you’ll never be able to feel their soul. And if you don’t listen to their soul, you’ll never know to whom you are talking. The E (Employee) When I hear the words “secure” or “benefits,” I get a sense of who the speaker might be at the core. The word “secure” is a word often used in response to the emotion of fear. When it comes to money, they have fiercely independent souls. So while the E often responds to the fear of not having money by seeking security, the S often responds differently. The people in this quadrant respond to fear, not by seeking security, but by taking control of the situation and doing it on their own. That is why I call the S group the do-it-yourself group. Self-employed people are often hard-core perfectionists. For people in this group, money isn’t the most important thing about their work. Their independence, the freedom to do things their way, and being respected as experts in their field are much more important than mere money. The B (Business owner) the B likes to delegate. Those who are true B’s can leave their business for a year or more and return to find their business more profitable and running better than when they left it. In a true S type of business, if the S left for a year or more, chances are there would be no business left to return to. So what causes the difference? Saying it simply, an S owns a job; a B owns a system and then hires competent people to operate the system. The ability to lead people. For S’s to evolve into B’s they need to convert who they are and what they know into a system, and many aren’t able to do that. Investors make money with money. They don’t have to work because their money is working for them. The I quadrant is the playground of the rich. Regardless of which quadrant people make their money in, if they hope someday to be rich, they ultimately must come to the I quadrant. 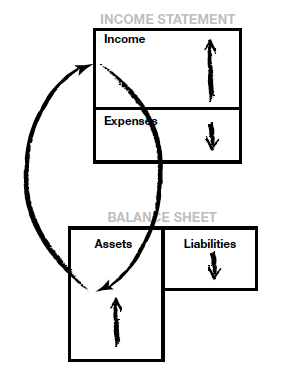 It’s in the I quadrant that money becomes converted to wealth. The CASHFLOW Quadrant simply makes distinctions on how income is generated, whether as an E (Employee), S (Self-employed), B (Business owner) or I (Investor). The differences are summarized below. OPT and OPM are found in the B and I quadrants. For the most part, people who work in the E and S quadrants are the OP (Other People) whose time and money are being used. One of the drawbacks to being a successful S is that success simply means more hard work. In other words, good work results in more hard work and longer hours. In designing a B type of business, success simply means increasing the system and hiring more people. In other words, you work less, earn more and enjoy more free time. The definition of wealth is the number of days you can survive without physically working (or anyone else in your household physically working) and still maintain your standard of living. For example, if your monthly expenses are $5,000 a month and you have $20,000 in savings, your wealth is approximately four months or 120 days. Wealth is measured in time, not dollars. Ultimately, it’s not how much money you make that matters, but how much money you keep, and how long that money works for you. Many people, rich and poor, operate constantly at the financial red line of their personal finances. No matter how much money they make, they spend it as fast as it comes in. The trouble with operating your car’s engine at red line is that the life expectancy of the engine is shortened. The same is true with operating your finances at the red line. Regardless of how much money people make, ultimately they should put some in the I quadrant. The I quadrant is where your money makes more money. It’s based on the idea that your money works hard so you don’t have to work. The primary distinction of people who earn their money from the I quadrant is that they focus on having their money make money. The I quadrant is the quadrant for working less, earning more, and paying less in taxes. It’s the fear of losing money that causes most people to seek security. If you want to get rich, you need to learn how to take risks. Learn to be an investor. You, as an individual, must now be financially responsible for yourself. We need to know how to invest—and investing is not a subject taught in school. Concentration rather than diversification requires you to become smarter and more intense in your thoughts and actions. People who take risks change the world. Few people ever get rich without taking risks. The Information Age means we all need to become more self-sufficient, grow up and take personal responsibility for our retirement. The idea of “study hard and find a safe, secure job” is an idea born in the Industrial Age. We’re not in that age anymore. The times are changing. Many people seek job security because that’s what they are taught, both at school and at home. Many of us are conditioned from our earliest days to think about job security, rather than financial security or financial freedom. If you look at the CASHFLOW Quadrant, you’ll notice that the left side is motivated by security. The right side is motivated by freedom. If you’re successful as an S, you’ll work harder than if you were in any of the other quadrants, and you’ll work harder for a long time. This is the pattern my rich dad recommended. It is the path to financial freedom. This is true financial freedom because, in the B quadrant, people are working for you, and in the I quadrant, your money is working for you. You are free to work or not to work. Your knowledge in these two quadrants has brought you complete physical freedom from work. The reality is that your boss’s job is not to make you rich. Your boss’s job is to make sure you get your paycheck. It’s your job to become rich if you want to. And that job begins the moment you receive your paycheck. If you have poor money-management skills, then all the money in the world won’t save you. If you budget your money wisely and learn about either the B or I quadrant, then you’re on your own path to great personal fortune and, most importantly, freedom. My rich dad used to say to his son and me that the only difference between a rich person and a poor person is what they do in their spare time. What you do after work with your paycheck and your spare time will determine your future. If you work hard on the left side, you’ll work hard forever. If you work hard on the right side, you have a chance of finding freedom. Many successful investors have lost many times before winning. Successful people know that success is a poor teacher. Learning comes from making mistakes. Your Goal is to own a system and have people work that system for you. There are three ways you can make it to the B side quickly. Get involved in network marketing (also called multi-level marketing or direct distribution systems). To be successful, you need to learn to overcome your fear of being rejected and to stop worrying about what other people say and think about you. To be successful, you must also learn to lead people. Working with different kinds of people is the hardest thing about business. Think of business systems as bridges that provide a path for you to cross safely from the left side to the right side of the CASHFLOW Quadrant. They work hard all their lives. They worry about money all their lives. They depend on others, such as family, a company pension, or the government, to take care of them. The boundaries of their lives are defined by money. They will not know what true freedom is. When you learn a profession, let’s say to be a doctor, you learn how to work for money. Learning to invest is learning how to have money work for you. The moment you have money working for you, you have your ticket to freedom. The reality is that real investors do not park their money. They move their money. It is a strategy known as the “velocity of money.” A true investor’s money is always moving, acquiring new assets, and then moving on to acquire even more assets. Only amateurs park their money. Success or failure, wealth or poverty, depends solely on how smart the investor is. A smart investor will make millions in the stock market. An amateur will lose millions. There are five types or levels of investors found in the I quadrant. This is the richest-people-in-the-world level. 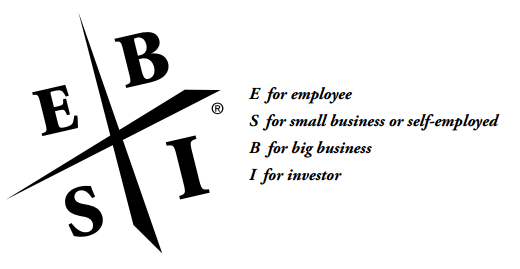 The Level-5 investor, a capitalist, is a business owner from the B quadrant investing in the I quadrant. Bankers would rather lend $10 million than $10,000 since it takes just as much time to lend thousands as it does millions. Remember, bankers love debtors because debtors make the bank rich. If you want to be a successful capitalist, you must know how to raise capital and how to use debt to make money. One great thing about freedom is the freedom to choose to live the life you want to live. Education gives us the power to turn information into meaning. Money is an idea that is more clearly seen with your mind. Remember that anything important can’t really be learned in the classroom. It must be learned by taking action, making mistakes, and then correcting them. That’s when wisdom sets in. The average person is 95 percent eyes and only five percent mind when they invest,” said rich dad. “If you want to become a professional in the B and I quadrants, you need to train your eyes to be only five percent and train your mind to see the other 95 percent.” Rich dad went on to explain that people who train their minds to see money have tremendous power over people who don’t. If money is not first in your head, it won’t stick to your hands. An asset puts money in my pocket. A liability takes money out of my pocket. The value of your home is an opinion that fluctuates with the market, while your mortgage is a definite liability not affected by the market. For a B and I, the value of your home is not considered an asset because it does not generate cash flow. The more people you’re indebted to, the poorer you are,” said rich dad. “And the more people you have indebted to you, the wealthier you are. That’s the game. If you take on debt and risk, then you should get paid. Making money is common sense. It’s not rocket science. But unfortunately, when it comes to money, common sense is uncommon. Your profit is made when you buy, not when you sell. If you take on debt personally, make sure it’s small. If you take on large debt, make sure someone else is paying for it. Millions of people have made life decisions based upon opinions handed down from generation to generation. And then they wonder why they struggle financially. Most people’s lives are determined by their opinions, rather than the facts. For a person’s life to change, they first need to change their opinions and then start looking at the facts. Too much due diligence is also called ‘analysis paralysis. Most people don’t have anyone who is indebted to them. They have no real assets (things that put money in their pocket), and they’re often indebted to everyone else. That’s why they cling to job security and struggle financially. If it weren’t for their job, they’d be broke in a flash. In fact, the average American is less than three paychecks away from bankruptcy. Most people go to school and learn to be players in the game, but no one explains the rules to them. No one tells them that the name of the game is: “Who Is Indebted to Whom? The real issue is the changes you must go through and who you become in the process. If you become addicted to money, it’s hard to break that addiction. People who were happy when they had money and upset or moody when they didn’t. The hardest part about moving from the left side to the right side is the attachment you have to the way you are used to earning money,” said rich dad. “It’s more than breaking a habit. It’s breaking an addiction. Create systems as a way of acquiring money. The world of money was one large system. And we as individuals must learn how to operate in certain patterns within that system. An E works for the system. An S is the system. A B creates, owns, and controls the system. An I invests money into the system. When a person feels the need for money,” rich dad explained, “an E will automatically look for a job, an S often will do something alone, a B will create or buy a system that produces money, and an I will look for an opportunity to invest in an asset that produces more money. Passion builds businesses, not fear. Build a system around your heart. Build a system around your passion. Having financial vision lowers your risk. Being financially blind increases risk. But you only need that vision if you want to operate on the right side. People on the left side think in words. To be successful on the right side, especially the I quadrant, you must think in numbers. It’s very risky trying to be an investor while still thinking predominantly in words. Chapter Eight – How Do I Get Rich? If you do what everyone else does, you’ll wind up having what everyone else has. When it comes to the subject of money, common sense is uncommon. The fact is that people who work the hardest do not wind up rich. If you want to be rich, you need to think independently rather than go along with the crowd. In my opinion, one great asset of the rich is that they think differently than everyone else. Goals are the ‘have’ part of these three words. People focus on what they have to do, rather than who they have to be. People think that working hard for money and then buying things that make them look rich will make them rich. In most cases it doesn’t. It only makes them more tired. They call it ‘Keeping up with the Joneses.’ And if you notice, the Joneses are exhausted. Strengthen your thoughts (being) so that you can take the action (doing) that will enable you to become financially free (having). Too many people leave school with passing grades, yet are not emotionally prepared to take risks, especially financial ones. The reason so many teachers are not rich is because they operate in an environment that punishes people who make mistakes. Instead, to be financially free, we need to learn how to make mistakes and manage risk. Financial IQ is 90 percent emotional IQ and only 10 percent technical information about finance or money. The most important conversation is the one you are having with yourself. What if you fail and never recover? He banned those statements because he truly believed that words are powerful tools. What a person says and thinks becomes real. What we said to ourselves became our reality. To be successful as an investor or a business owner, you have to be emotionally neutral to winning and losing. Winning and losing are just part of the game. The main reason so many people struggle financially isn’t because they lack a good education or are not hardworking. It is because they are afraid of losing. If the fear of losing stops them, they’ve already lost. Most people suffer financially because their emotions are in control of their thoughts. We as human BE-ings, all have the same emotions. What determines the differences between what we DO and what we HAVE in life is primarily how we handle those emotions. It’s not what happens in one’s life that matters, but it’s the meaning one puts on what happens that matters. Read books on economic history. Economies change, but history repeats. Remember, the only difference between an $80,000 deal and an $800,000 deal is a zero. The waves of the financial markets are driven by two human emotions: greed and fear. I don’t think that depressions are things of the past because we will always have those emotions of greed and fear. One big reason the rich keep more of their wealth is simply because they operate as corporate bodies, not human bodies. Build a business, and buy real estate.” The idea was to make a lot of money via C corporations, and shelter the income through real estate. In the Information Age, quality information is our most important asset. You’ve got to walk before you can run. A journey of a thousand miles begins with a baby step. Long-term financial success is not measured by how big your stride is, but by the number of steps, the number of years, and the direction in which you’re moving. To me, one of the primary reasons E’s and S’s have difficulty moving to the B and I side is because they are too afraid of making mistakes. True learning requires mental, emotional, and physical learning. That is why action always beats inaction. If you take action and make a mistake, at least you have learned something, be it mentally, emotionally, or physically. Ultimately, the way we learn is by making mistakes. People who are afraid of taking action, out of fear of making mistakes, may be mentally smart, but they are also emotionally and physically handicapped. The key to making any investment is setting a big goal and approaching it systematically, taking baby steps first and then gradually increasing the size of your investments as your learning and experience increase. You will want to push yourself beyond your comfort zone—but gradually. We are programmed to mind everyone else’s business, and ignore our own. By looking at this financial statement, you can begin to see how we have been programmed from an early age to mind everyone else’s business and ignore our own business. Fill out your own personal financial statement. 1) I want to increase cash flow (i.e., passive income— income you earn without you having to work for it) from my assets to $_______per month. 1) I want to decrease my debt by $_______. 2) I want to increase cash flow from my assets to $_______per month. Using my five-year goals, I will complete my financial statement again to show how it will look five years from today. People who cannot control their cash flow work for those who can. The primary reason most people have money problems is that they were never schooled in the science of cash-flow management. They were taught how to read, write, drive cars, and swim, but not how to manage their cash flow. Without this training, they wind up having money problems and then work harder with the belief that more money will solve the problem. Good debt was debt someone else paid for you. Bad debt was debt that you paid for with your own sweat and blood. That is why I love rental properties. Buy rental real estate because “the bank gives you the loan, but your tenant pays for it. 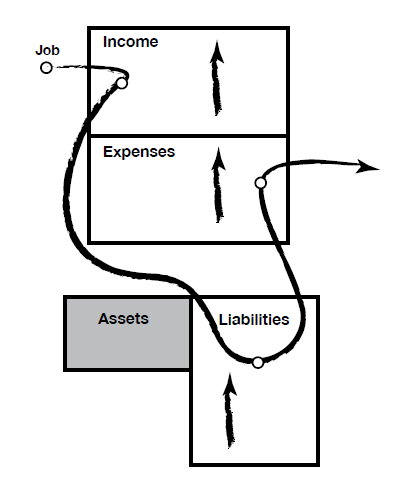 For most every liability, there must be an asset, but they don’t appear on the same set of financial statements. For every expense, there must also be income, and again, they do not appear on the same set of financial statements. Business and investing are not risky, but being under-educated is. What Is Proper Cash-Flow Management? The direction of cash flow is everything. A rich person focuses his or her efforts on acquiring assets, not working harder. Business and investing are not risky, but being under-educated is. Similarly, being misinformed is risky, and relying on a safe, secure job is the highest risk anyone can take. Buying an asset is not risky. Buying liabilities you have been told are assets is risky. Minding your own business is not risky. Minding everyone else’s business and paying them first is risky. Start small, and learn to solve problems. If you want to acquire great wealth quickly, take on great financial problems. Type A: Investors who seek problems. Type B: Investors who seek answers. Type C: Investors who seek an “expert” to tell them what to do. If you start small and learn to solve problems, you will gain immense wealth as you become better and better at solving problems. So to become rich quicker, become a student of the skills needed by a business owner and investor. Seek to solve bigger problems, because inside big problems lie huge financial opportunities. That is why I recommend becoming a B first, before becoming an I. Attend business-opportunity conventions or trade expos in your area to see what franchises or business systems are available. A mentor is someone who tells you what is important and what is not important. Focus on passive income and spend my time acquiring assets that provide passive or long-term residual income. Instead of living below your means, focus on expanding your means. Focus on building the asset column and increasing our passive income from capital gains, dividends, residual income from businesses, rental income from real estate, and royalties. Choose your mentors wisely. Be careful from whom you take advice. If you want to go somewhere, it is best to find someone who has already taken the journey. Who you spend your time with is your future. Write down the six people you spend the most time with. The six people you spend the most time with are your future. Inside every disappointment lies a priceless gem of wisdom. Disappointment is an important part of learning. Just as we learn from our mistakes, we gain character from our disappointments. The only person who determines the thoughts you choose to believe about yourself, is you. Be aware of the thoughts and words generated by your emotions. If you are not aware when your emotions are doing your thinking, you will never survive the journey. You will always hold yourself back. Remember that the only person who determines the thoughts you choose to believe about yourself is you. The reason most people stop and turn back from their dreams is because the tiny person found inside each of us wields more power than our bigger person. Take Action. Believe in yourself, and start today. Begin building pipelines of cash flow to support you and your family.